At a time when Latin America is experiencing societal unrest from human rights violations, corruption and weak institutions Government and Governance of Security offers an insightful understanding for the modern steering of crime policies. 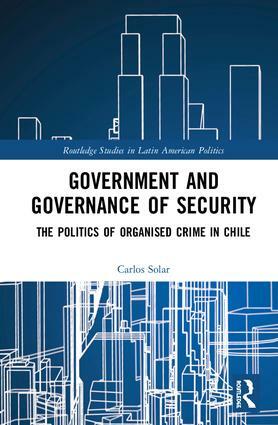 Using Chile as a case study, the book delivers an untold account of the trade-offs between political, judicial and policing institutions put in practice to confront organised crime since the country’s redemocratisation. In an effort to encompass the academic fields of political science, public policy and criminology, Carlos Solar challenges the current orthodoxies for understanding security and the promotion of the rule of law in developing states. His research aptly illuminates the practicalities of present-day governance and investigates how networks of institutions are formed and sustained across time and, subsequently, how these actors deal with issues of policy consensus and cooperation. To unveil the uniqueness of this on-the-ground action, the analysis is based on an extensive revision of public documents, legislation, media accounts and interviews conducted by the author with the key policy makers and officials dealing with crimes including drug-trafficking, money laundering and human smuggling. Government and Governance of Security will be of interest to scholars of Latin American studies, security and governance and development. Carlos Solar is a British Academy Postdoctoral Fellow at the Latin American Centre in the University of Oxford. He has published in the Journal of Strategic Studies, International Politics, Global Crime, Latin American Policy, Democracy and Security and Mexican Studies.